A Diaper Shower party is great for the soon to be mother of more than one child. Traditionally a baby shower is only thrown for the new mom about to welcome her first child into the family so that friends and family can load her up with all that baby stuff she will need. If you are a first time mama you and already have all that your baby supplies sorted you can throw a Diaper Baby shower where all the guest shower you with diapers (or nappies as we call them Down Under) If you're on to your second or third child and just like the idea of getting the girls together for some fun and games then consider a diaper shower. To really rock your diaper theme, make these adorable diaper shower invitations that look exactly like a diaper! They are sooo cute and will be a huge hit with your guests. Blue Bazzill cardstock and “Sarah’s Jeans” scrapbook paper - you can use any blue card and patterned paper if you prefer. Adhesives - Xyron & 3L Scrapbook Adhesive. Sewing machine, cotton etc for stitching. Creative Memories oval cutter or an oval template. 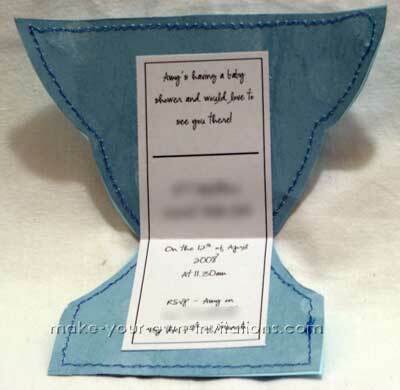 Create a diaper template on to some stiff card. Trace your diaper template on to the back of your Bazzill cardstock and cut it out. Trace the template again on to the FRONT of the patterned paper and cut it out. This paper will be the inner lining of the nappy. 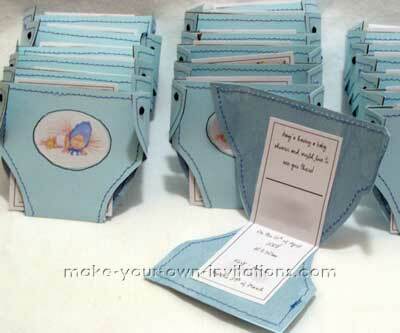 Stick one of the brads through the front left tab of the bazzill cardstock diaper and fold back the prongs. Repeat for the right tab. These will give the look of snaps on a diaper. Alternatively you can glue down a couple of buttons if you don't have brads. To stick the cardstock and the patterned paper lining together you need to line them up and stitch around the edges about a 1/4" in from the sides. You may wish to glue the two peices together before you start to sew them so that they wont move. Find a picture or some clip art that you like and print on to paper, cut around it in an oval shape. Run it through a xyron machine to make it a sticker if you have access to one. Stick it to the front of the diaper and use a Black Zig pen was to create a border around it. A picture of a baby porcupine was used for these invites. Lastly an inch of magnet from a roll of magnetic tape (bought at a dollar store) was stuck to the back, so that those who get the invite can put them on the fridge as a reminder and keepsake. Small maps from Google Maps can be printed to include in the nappy for travelers as the baby shower was not held at the Mom-to-be’s house. In this picture you can just see the little maps that I included sticking out the “leg” side of the nappy. You can also see the stitching around the outside, and the two little brads that look like nappy clips.